Court documents suggest there was no attempt to slow down or speed up before the vehicle went off the road into the rocks below. The death of a Hart family that had once captured the world's attention has left troubling questions. 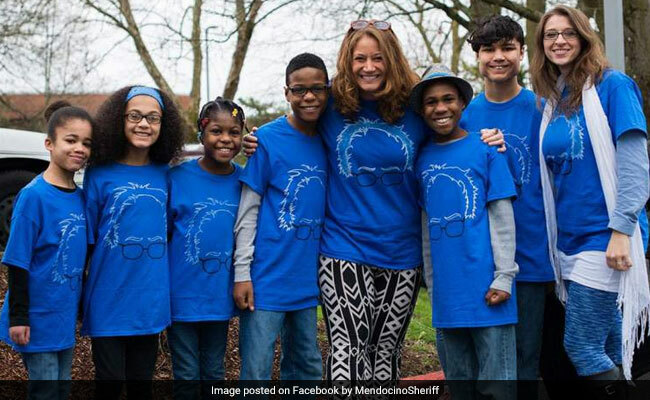 The crash that killed a married couple and at least three of their adopted children after their vehicle plunged off a California cliff last week may not have been an accident, according to media reports. Greg Baarts, acting assistant chief of the California Highway Patrol's northern division, told NBC affiliate KGW8 that investigators have "reason to believe . . . that the crash was intentional." Baarts, who was not immediately available for comment Sunday evening, told KGW8 that the finding was based on preliminary information. Earlier reports indicated that the speedometer of the SUV that authorities said was carrying the family of eight - the two parents and their six adopted children - was "pinned" at 90 mph when it went over the cliff on the Pacific Coast Highway. Fox affiliate KPTV in Oregon reported that this indicates the vehicle remained in motion after it fell and just before it hit the rocks 100 feet below. Investigators also did not find any marks showing that the vehicle either accelerated or slowed down before it reached the cliff, or any evidence that it crashed into the embankment as it "traversed towards the tidal zone below," according the documents cited by KPTV. Killed are the two mothers, Jennifer Jean Hart - who was driving - and Sarah Margaret Hart, both 38, and at least three of their adopted children. The other three are missing and are feared to be dead. The death of a family that had once captured the world's attention has left troubling questions about what may have preceded the Monday afternoon crash at the ocean overlook near Westport, California, a small community about 180 miles north of San Francisco. Child services officials in Washington state, where the family lived, have confirmed that they began investigating the Harts over "alleged abuse or neglect" shortly before the accident. The Washington Department of Social and Health Services said it tried unsuccessfully to contact the family on three occasions, first on March 23, three days before the crash, according to a statement. The agency tried again Monday, the day of the crash, and Tuesday. "We have not made any findings in this investigation and we had no prior history with this family," the agency said. "We are working with all involved law enforcement agencies on their respective investigations." Investigators are looking into the possibility of suicide, although police had said earlier that they have no reason to suspect that the crash was intentional. KPTV reported that investigators have secured a warrant to search the family's home, including documents such as bank and cellphone records, credit-card statements, journals and suicide notes. A spokesman for the California Highway Patrol did not respond to a request for comment Sunday. The Mendocino County Sheriff's Office said the family may not have intended to stay away from home for long that day because many of their belongings, including a pet and some chickens, were still at their home. First responders immediately found the bodies of Jennifer and Sarah Hart and their children Markis, 19, Jeremiah, 14, and Abigail, 14. The others - Devonte, 15, Hannah, 16, and Sierra, 12 - remain unaccounted for. The family had previously lived in a suburb of Portland, Oregon, before they moved north across the Columbia River to Woodland, Wash. Authorities said the family left Oregon to escape intense scrutiny that began in 2014, when Devonte Hart was photographed sobbing in the arms of a white police officer in Portland, where people had gathered to support protests in Ferguson, Missouri. The demonstration was prompted by a grand jury's decision not to charge police officer Darren Wilson in the shooting of 18-year-old Michael Brown in Ferguson. Devonte and his siblings were black. Jennifer and Sarah Hart were white. The family's mixed races have fueled suspicion and anger about the crash, reflected in hundreds of comments left on Facebook postings mourning the family. Many of the comments questioned the motives of white women who adopted black children. Meanwhile, those who knew the Harts described them as inspiring and devoted parents who had been unfairly subjected to criticisms and assumptions about their motives for adopting the children. Friends also said that the couple tried to keep their children insulated from death threats and hateful emails prompted by Devonte's viral picture. But their neighbors in Washington said previous incidents involving the Harts' children have concerned them. Bruce DeKalb said Devonte regularly came to his home to ask for food and said his parents weren't feeding him. The teen also asked him and his wife to call Child Protective Services, DeKalb said. Last month, another sibling, Hannah, knocked on his front door at 1:30 a.m., DeKalb said. She was covered in weeds after jumping out of her family's second-story window. DeKalb said the teenager, who was missing some front teeth and who he thought was only 7 years old, was "rattled to the bone."